MINNEAPOLIS & REHOVOT, Israel--(BUSINESS WIRE)--Nov. 13, 2018-- Helping customers pioneer a new era in additive manufacturing for production-grade metal parts, Stratasys (Nasdaq: SSYS) is releasing further details of its new platform currently being developed and designed for short-run metal applications. 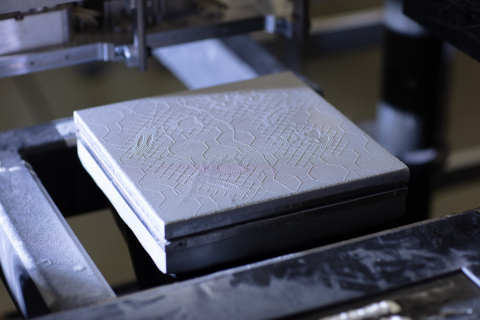 First unveiled earlier this year, the additive platform is based on Stratasys’ innovative, first-of-its-kind “Layered Powder Metallurgy” (LPM™) technology, designed to make production of metal parts quicker, easier and more cost-effective than ever before. Intended to disrupt conventional manufacturing approaches, the advanced platform is being developed to combine the value of additive manufacturing with short-run metal parts production. The innovative technology is built to drive improved efficiency and cost savings using standard Powder Metallurgy (PM) alloys, mechanical properties with high accuracy and controlled shrinkage, as well as extremely fast throughput. Stratasys is currently in closed-loop feedback discussions with OEMs and Tier-1s on the new metals platform. More details – including product specs and detailed launch timelines – will be made available soon. See Stratasys in action at formnext 2018. View the LPM additive process in action by clicking here. Stratasys is discussing its new metals solution and demonstrating production parts at formnext 2018 in Messe Frankfurt, Germany on Tuesday, November 13 – Friday, November 16. The company is offering exclusive hands-on demos, detailed customer use-cases and presentations throughout the show in Hall 3.1, Stand G40. Stratasys® is a global leader in additive manufacturing / 3D printing technology, and is the manufacturer of FDM® and PolyJet™ 3D Printers. The company’s technologies are used to create prototypes, manufacturing tools and production parts for industries, including aerospace, automotive, healthcare, consumer products and education. For 30 years, Stratasys products have helped manufacturers reduce product-development time, cost and time-to-market, as well as reduce or eliminate tooling costs and improve product quality. The Stratasys 3D printing ecosystem of solutions and expertise includes: 3D printers, materials, software, expert services and on-demand parts production. Online at: www.stratasys.com, http://blog.stratasys.com and LinkedIn. The statements in this press release relating to Stratasys’ beliefs regarding the development process and benefits customers will experience from the new Stratasys metal platform and Stratasys’ expectation as to the timing of development and launch times of the new Stratasys metal platform, are forward-looking statements reflecting management's current expectations and beliefs. These forward-looking statements are based on current information that is, by its nature, subject to rapid and even abrupt change. Due to risks and uncertainties associated with Stratasys' business, actual results could differ materially from those projected or implied by these forward-looking statements. These risks and uncertainties include, but are not limited to: the risk that customers will not perceive the benefits of the new Stratasys metal platform to be the same as Stratasys does and the risk that unforeseen technical and development difficulties will delay the completion of development and shipping of the new Stratasys metal platform; and other risk factors set forth under the caption “Risk Factors” in Stratasys' most recent Annual Report on Form 20-F, filed with the Securities and Exchange Commission (SEC) on February 28, 2018. Stratasys is under no obligation (and expressly disclaims any obligation) to update or alter its forward-looking statements, whether as a result of new information, future events or otherwise, except as otherwise required by the rules and regulations of the SEC.